Pancho Segura, who surmounted a sickly and impoverished childhood in Ecuador to become one of the world’s leading tennis players in the mid-20th century, died on Saturday at his home in Carlsbad, Calif. He was 96. The cause was complications of Parkinson’s disease, said his son, Spencer. Displaying a blistering two-handed forehand, a keen sense of court strategy and a crowd-pleasing flair, Segura flourished in the two decades preceding the open era, first as an amateur and then as a member of Jack Kramer’s pro tour. He was later the mentor to a teenage Jimmy Connors and coached him when he competed in Grand Slam events of the 1970s. Arriving in the United States in 1940 with little knowledge of English — his legs bowed by a childhood case of rickets — Segura was recruited by the University of Miami’s tennis coach, the prominent amateur player Gardnar Mulloy. He won the N.C.A.A. singles tennis championship each year from 1943 to 1945. He reached the singles semifinals of the United States Nationals in Forest Hills, Queens, every year from 1942 to 1945. Segura turned pro in 1947 and barnstormed around the world with Kramer and figures like Pancho Gonzalez, Bobby Riggs, Tony Trabert and the Australians Lew Hoad, Ken Rosewall and Frank Sedgman. He won the prestigious U.S. Pro Tennis Championships singles title each year from 1950 to 1952. He was inducted into the International Tennis Hall of Fame in Newport, R.I., in 1984. Francisco Olegario Segura was born on June 20, 1921, the eldest of 10 children of Domingo Segura and his wife, the former Francisca Cano. She gave birth to him aboard a barge on a river while trying to reach a hospital in Guayaquil, Ecuador, from the family home in Quevedo. In addition to rickets, he also had malaria as a child, but doctors said that tennis would strengthen him. He began playing while a ball boy at an exclusive club in Guayaquil, getting the job through a wealthy businessman who employed his father as a caretaker. As a youngster, Segura was too small (he grew to 5-foot-6 and 150 pounds or so as a pro) and too weak to use the orthodox one-handed forehand so he developed his two-fisted shot. PhotoSegura using his two-handed forehand at a tournament at Madison Square Garden in 1966. Credit United Press International He was a prominent player in South America before winning national collegiate titles at Miami. 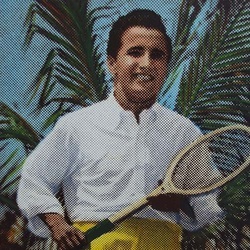 In addition to his strong showings at Forest Hills in the forerunner of the United States Open, Segura won the United States clay-court championship and the national indoor championship in the mid-1940s. Playing on Kramer’s tour before the arrival of open tennis in 1968 brought huge paydays for pros, Segura’s largest prize money for a single event was $5,000, as he recalled it. He won that when he bested Gonzalez in Australia. “I beat Gonzalez, 13-11, in the fifth in Sydney, but on the tour I made $300 a week and had to drive 500 miles every night,” he said. But he played with royalty and with celebrities in settings he could hardly have imagined while growing up in Ecuador. After leaving the pro tour in 1962, Segura became a teaching pro at the Beverly Hills Tennis Club and what is now the Omni La Costa Resort & Spa, in Carlsbad, near San Diego. He lived at the resort. In the late 1960s, Segura honed Connors’s game at the request of his mother, Gloria, who had played in the United States Nationals in the mid-1940s and was coaching her son, but took him to the Los Angeles area so he could work with Segura. “He is the player I always wanted to be,” Segura told The New York Times in 1977. In addition to his son, from his marriage to his first wife, the former Virginia Smith, which ended in divorce, Segura is survived by his second wife, the former Beverley Moylan; his daughter, Maria Segura, from that marriage; his sisters Catalina, Olivera and Eleanor Segura; a brother, Andres, and four grandchildren. Segura became an American citizen in 1991. In his late 80s, reflecting on his life, he reveled in the possibilities that tennis held even for a poor youngster like himself.